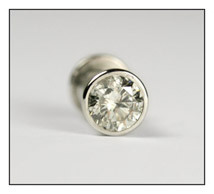 Ear stretching has become very popular recently, with a whole variety of ear plugs, tunnels and flares on offer. 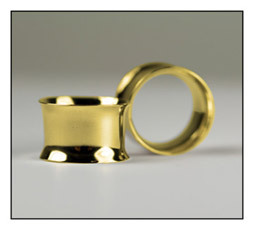 So we thought it would be a good to give you an introduction to our precious metal tunnels and plugs. In the past we have made many custom plugs and tunnels with great success but it has only been relatively recently that we have been able to offer a full range available through our website. This has previously been a problem, as sourcing tube in the appropriate size has been impossible. This meant that the tube has had to be handmade making it a very labour intensive and sometimes an inconsistent process. So after much consideration and experimentation we have now managed to design and modify a set of rollers that allow us to fabricate our own lengths of tube ranging upwards from 7mm (external diameter).The result of this is that we are now able to offer a comprehensive and consistent selection of sizes, both tunnels and plugs are all available in silver (clear coated for protection against allergies), 9ct, 14ct and 18ct Yellow and White Gold, Platinum and even 22ct Gold (price on application). Our stock range is currently made up of double flares although other styles are entirely possible. We have already noticed several benefits to our plugs and tunnels. Being handmade from scratch - we can determine exactly how thick they are. This means they can be extremely light weight making them very comfortable to wear, as well as visually maximising the size of the stretch itself. Also being available in clear coated silver means they are relatively affordable whilst having none of the drawbacks of wearing uncoated silver in a piercing. As well as the tunnels I have mentioned we can also offer entirely metal two piece plugs which have a screw on back plate. These can be set with a huge variety of stones or have designs pierced (cut by hand) out of the front. 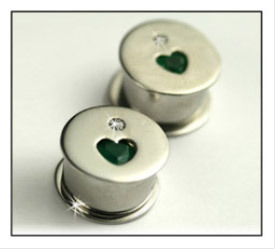 Another variation we are able to offer are horn or acrylic plugs with a precious metal disk set into the front of the plug, this disk can then also be set with stones or a unique design pierced as with the all metal plugs. Please see our custom made section to find out more. 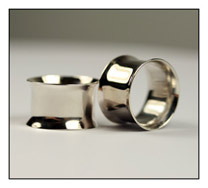 So that is a basic overview of our new range of plugs and tunnels. Please check out our website for the complete range. If you have any ideas for your very own set of custom plugs or tunnels unique to you then please don’t hesitate to give us a call or drop us an email. Hello I would like to get a quote on a pair of double flared tunnels 9/16 platinum.